Just a brief note to let you all know that our Kintalk blog has now merged with sister blog Heritage et AL. If you subscribe to Kintalk, then I encourage you to change your subscription over to Heritage et AL to be sure of being kept up to date with all the family history happenings, and to learn more about our heritage collections and heritage news. Kintalk first went live in July 2008, originally edited and authored by Karen Kalopulu and the family history team; and was carried on in her name after she passed away in 2009. Popular and information rich posts from Kintalk have been migrated over to Heritage et AL, so you will find them there instead. Heritage et AL was launched in May 2012 . . . "Four research centres and the Sir George Grey Special Collections and a whole heap of incredible heritage library collections, arranged around two harbours and many volcanoes! Plus cool links and heritage news stories. Stay tuned .."
Now both blogs will be together on the Heritage et AL blogspot - so don't forget to subscribe to keep up to date! Happy hunting . . .
At Central Research, we have an international family history collection and I am based there. Last year, we piloted a new initiative called Brick Wall Tuesday, where I got to do Book-A-Librarian sessions at the other research centres. Each Tuesday, I am at a different research centre. It was very successful, so we decided to continue this initiative again starting from 13th February at West Auckland Research Centre at Waitakere Library. North Auckland Research Centre, Takapuna Library - 1st Tuesday of every month. Phone 09 890 4919 or email Library.Northheritage@aucklandcouncil.govt.nz to book. West Auckland Research Centre, Waitakere Library - 2nd Tuesday of every month. Phone 09 892 4966 or email Library.Westheritage@aucklandcouncil.govt.nz to book. 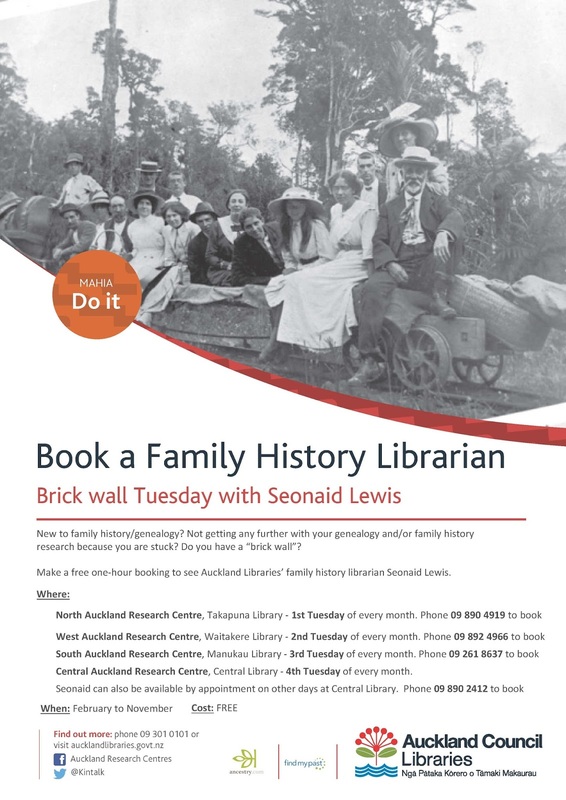 The West Auckland Historical and Genealogy Society hold their branch meeting in this research centre on the same day 10-12pm, and everyone is welcome. South Auckland Research Centre, Manukau Library - 3rd Tuesday of every month. Phone 09 261 8637 or email Library.Southheritage@aucklandcouncil.govt.nz to book. Central Auckland Research Centre, Central Library - 4th Tuesday of every month. The Auckland City branch of the New Zealand Society of Genealogists hold their branch meeting in this research centre on the same day, 10-12pm and everyone is welcome. Seonaid can also be available by appointment on other days at Central Library. Phone 09 890 2412 or email arc@aucklandcouncil.govt.nz to book. It is a “how to” training service to enable customers to be able to carry out their own research. It is not really a research service i.e.- we are not doing the research for the customer, although we may do so during the tutorial session. of databases and pdfs of books. 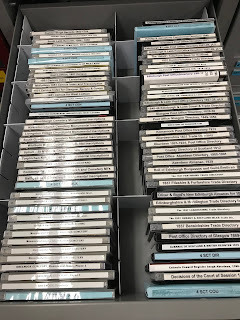 They are hidden treasures, used mainly by the experienced researcher who realises that not everything is online as yet and that family history societies and self-published authors still use CD-ROM technology, as its relatively cheap and easy to make their projects available. 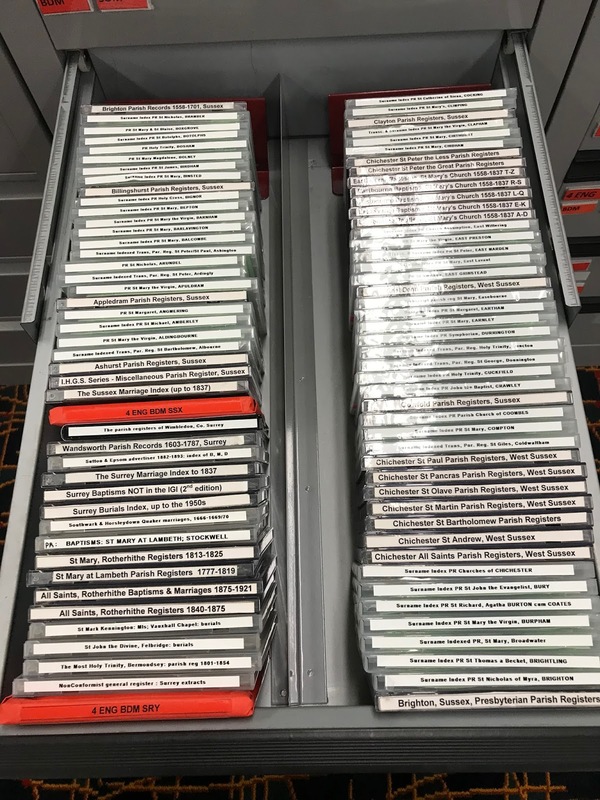 Although all CDs are listed on the library catalogue, we also have a handy index to assist customers with seeing what is in this unique collection. 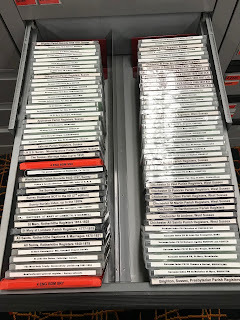 The first couple of pages list the newly received CDs which amongst others, include various Berkshire and Oxford parish registers, and a 200 disk set of Stonepics Newfoundland cemetery images and transcriptions - this collection is so large, its in its own black binder and is on top of the CD-ROM cabinets! 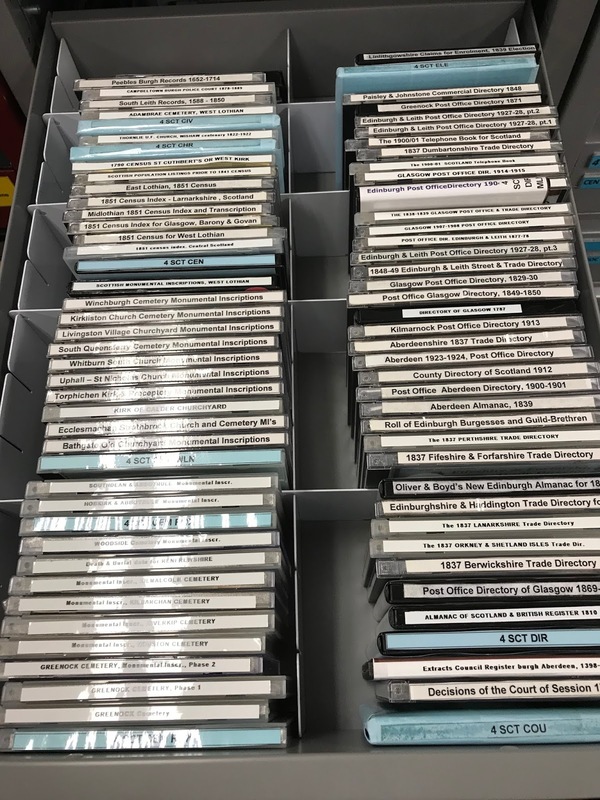 If you want to view what we have available in our CD-ROM collection, just click the link here to open the pdf document.